Reprint army manual from 1989. 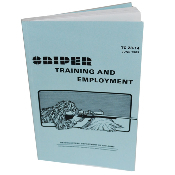 This circular provides doctrine for the tactical employment of the infantry sniper. It also provides the information needed to train and equip snipers and to plan their missions and operations. It is intended for use by commanders, staffs, instructors, and soldiers at training posts, Army schools, and units.